This 101-year-old Nyingma lama and yogi, is the abbot of dozens of monasteries in India and Nepal. He is extremely active, traveling constantly and helping sentient beings with his every action. and spends most of his money releasing fish from the Calcutta fish markets. his several thousand disciples are vegetarian. Question: Why did you decide to stop eating meat? How old were you when you made this decision? Question: Why do you think vegetarianism is an important aspect of practicing the Dharma? Question: Some claim that one can help the animals one eats by praying for them, and thus eating meat is compassionate. Other than for the most accomplished yogis and lamas, what do you make of this claim? Question: What is your opinion on His Holiness the Dalai Lama's meat eating? Question: Do you know other lamas who are vegetarian? Question: Do you see Tibetan Buddhists in exile making a sincere effort to reduce their meat consumption and become vegetarian, or has meat eating become an entrenched aspect of Tibetan culture? Question: Many Tibetans quote a Hinayana text that says that if meat is not heard, seen or suspected to have been killed for you, then it is acceptable to eat it. How do you respond to this? Question: Some monks have told me that since insects are killed in the production of rice and other vegetables, then there is really no difference between eating those things and eating meat. What do you think about this? “This would mean that you wouldn’t eat anything and let the people die. If you say you were going to go for a week without killing insects through the food you eat, then you would die. If you die, this precious human life is being wasted. So if you just let your body be destroyed, that means you are taking your own life, which is killing in itself. You can always take the insect from the rice when you see it and let it free outside. You don’t necessary have to kill beings to eat. Although, when we walk we crush many insects under our feet. We may not see them or observe them, but still we must be killing them. Not being aware doesn’t mean that we have not created any sin. Because after all, cause and effect are always there. I was fortunate to meet with the daughter of Tarthang Tulku Rinpoche, named Pema. Tarthang Tulku Rinpoche is the most prominent Nyingma figure in the United States, and his daughter grew up in the U.S., studying at Berkeley. She considers herself to be close friends with Chatral Rinpoche. “Most Tibetans in Tibet don’t eat eggs. When Chatal Rinpoche was offered crepes a while ago, he asked me if they had eggs in them. I shook my head yes, and Rinpoche was repulsed by it and refused to eat them. Meat eating is high on Chatal Rinpoche’s spiritual radar. Rinpoche is so connected with animals. He loves animals. He loves watching wildlife videos on T.V. His great compassion caused him to stop eating meat. He gives all his money to save 70 truckloads of fish in Calcutta. It is his most important yearly activity. He prays for every bucket-full he dumps into the ocean, trying to bring them to a higher rebirth. Tibetans have a guilt complex about their meat eating. When I say I’m vegetarian, they say ‘That’s great!’ as if it is an enormous sacrifice that they can’t fathom. In the Dharma, it is not just a matter of not doing something—not eating meat for instance—but actively protecting life. Rinpoche lives this. He is so connected on a vast level to sentient beings and their suffering. 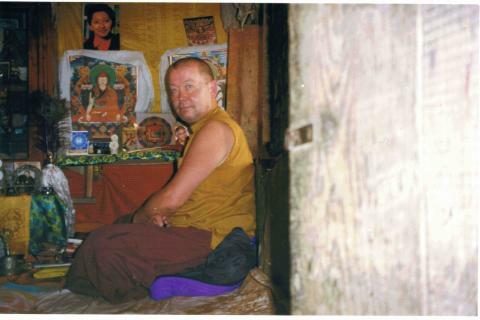 “Rinpoche is drawn to dark, sinful, murderous places—to Hindu animal sacrifice areas. He took myself and his daughter Sera Sati to one once. It was beautiful on the outside, with flowers and carvings. He bought some birds in a cage and released them at the top of the roof. Then we came to the goat sacrifice place. At first I had my eyes closed, but then I saw it—innocent goats being murdered and blood everywhere. I was horrified. 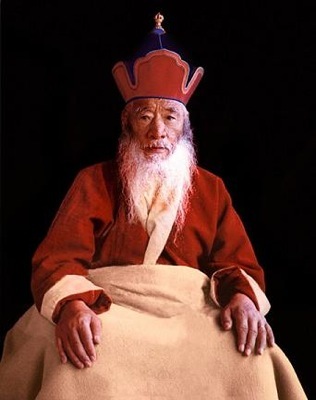 Rinpoche calmly walked all over the goat blood as if he was doing walking meditation. He wasn’t a bit fazed by it. I think he was trying to teach us the lesson of being fearless and patient in the face of suffering. Goats are very sensitive beings—they were very afraid. It’s so awful. Meat was such a turnoff to me at the cafeteria in Berkeley, where I went to school. Seeing it made me nauseous. Chatal Rinpoche wrote a piece called On Flesh Eating which I will re-produce in its entirety at this point. It was translated by my friend Geshe Phelgye, and is yet unpublished in English, but available in Tibetan at bookstores. If some people argue that Buddha’s condemnation of meat applies only to the seven classes of Vinya vows and is unrelated to the Mahayana and Tantrayana, then this clearly indicates their lack of proper knowledge. They have not even seen the following chapter from the Vinya sutra: “Meat-eating is the diet that vanquishes the three realms (desire, form and formless realms). It is the weapon that destroys the potential for liberation. It is the fire that burns the seed of Buddhahood. It is the shaft of lightning that ends rebirth in the higher realms or a precious human rebirth.” Since meat-eating is not approved for anyone, not for monks, nuns or lay-holders, those who are committed Buddhist practitioners are never allowed to eat meat. One who has taken the Bodhisattva vows will incur great sin in eating the flesh of sentient beings who were one’s parents in past lives. Even in Tantryana meat is not allowed until one attains the ultimate view and wisdom. Tulshig Pema Dudul, speaking of a pure appearance, said: "The great compassionate one (Avalokitishvara) appeared in the sky in front of me and spoke 'You have attained generating stages and acquired some knowledge, yet you are lacking in love and compassion. Compassion is the root of the Dharma and with compassion it is impossible to eat meat. One who eats meat will experience much misery and illness. Look at the miserable ones! Every one is experiencing suffering according to their deeds…One who gives up meat will not experience this suffering. Instead, great guru Buddha's deities, Bodhisattvas, and dakinis will rejoice and protect you.’” Having heard this, Tulshig gave up meat forever. Many more renowned adepts have condemned meat as a poisonous food. Machig Labdron, a renowned female practitioner of chod had said, "For me eating meat is out of the question. I feel great compassion when I see helpless animals looking up with fearful eyes." Rigzin Jigme Lingpa, a great yogi of the Nyingma tradition stated, "Just as in the story of Arya Katayana going to beg for food, I see that the animal which this meat must have come from was our mother in earlier lives. If so, can we eat our own mother’s flesh that was slaughtered by butchers? Imagine how much concern would arise! Therefore, if we concentrate honestly, there is no way we won't feel compassion for the animal." Bodhisattva Jigme Chokkyiwangpa said, "As Buddhists we have taken the triple refuge. To take refuge in the Dharma, one must practice nonviolence to sentient beings. Thus, if we continue to eat meat which has come from the slaughtering of innocent animals, then is this not a contradiction of our Buddhist commitments?" Knowing all these faults of meat and alcohol, I have made a commitment to give up meat and alcohol in front of the great Bodhi tree in Bodh Gaya with the Buddhas and Bodhisattvas of the ten directions as my witnesses. I have also declared this moral to all my monasteries. Therefore, any one who listens to me is requested not to break this Dharmic moral.